Being only able to get out at weekends is all very well, but I needed some solitude to ease back into it properly. A chance to go at my own pace and indulge when necessary, scramble through scrub, stand up to my knees in cool water and walk great distances if the need arises. Relying on my sight alone might mean I miss some chances, but what I don’t know doesn’t bother me. 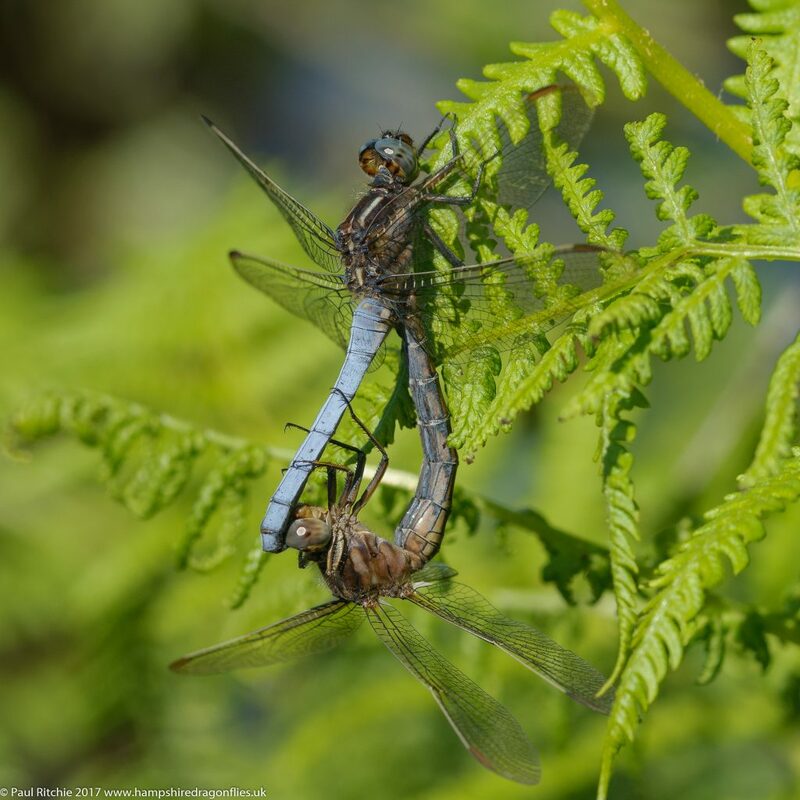 A usual look first thing at the ponds provided a number of Four-spotted and Broad-bodied Chasers, a couple of Emperor and the usual supporting cast of damsels. 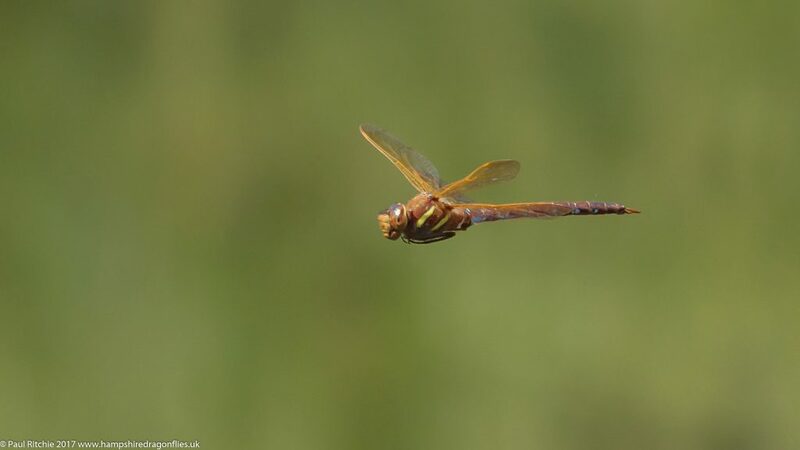 Taking the short route through the hedge to Long Lake I saw my first Brown Hawker of the season flying tantalisingly over the reeds so I got to work, knowing full well that this would be a challenge. I wasn’t convinced I had him in the bag, so finding another at the other end of the lake I decided to remain a while. 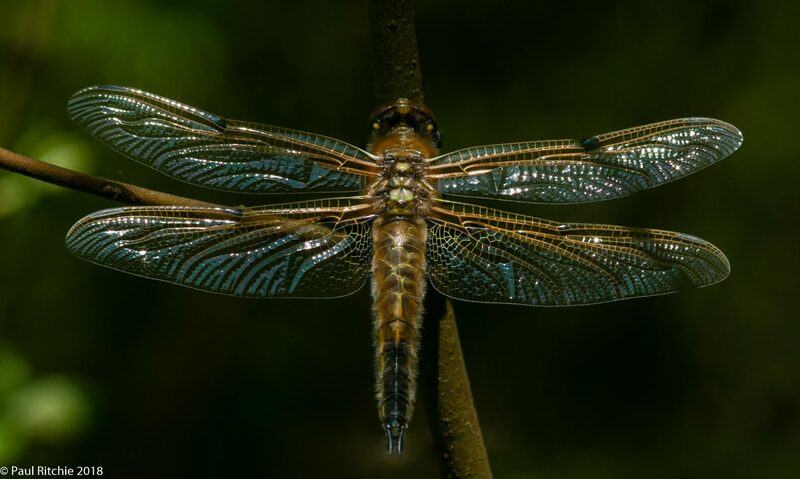 Just me, a Brown Hawker and an Emperor filling the sky with their acrobatics and fisticuffs while Four-spotted Chasers and a large sprinkling of resident damselflies frolicked over the shallows. This is what it’s all about; just watching the show. Once I’d had my moment of mindfulness I took a walk to scratch an itch; I wanted to find the pond where I’d been informed a population of Small Red were present. I’ve seen them at Warren Heath but not here, until today. Shattered from the walk and the humid heat, I had a long walk back to the car and obviously missed a more direct route, finding myself along a path which looked familiar; I’d been here last year on one of my famous wanders. Had I not taken a wrong turn I wouldn’t have experienced a magic moment. 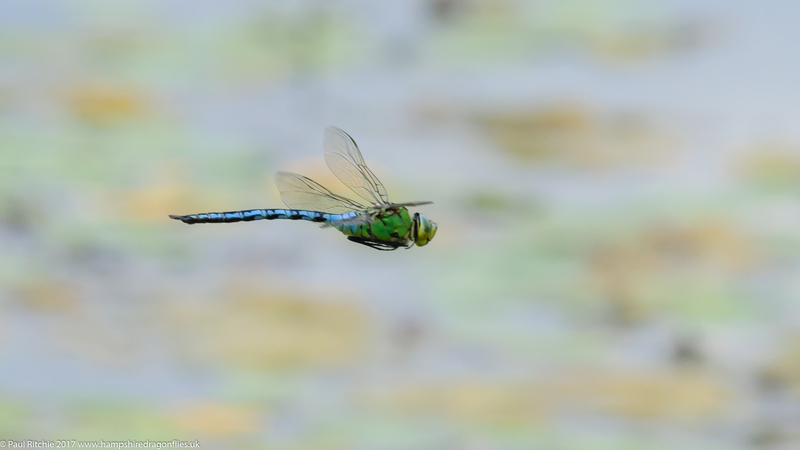 Hawking along the path ahead of me turned about and flew around me twice giving me a perfect view of a female Brilliant Emerald! Unmistakable with her long, protruding ovipositor. What a result! A ‘lifer’ moment. It would’ve been nice to grab a photo naturally, but she didn’t stay around for one. Such a fleeting glimpse, but time stopped for that moment. I waited around just in case she might reappear, and reluctantly moved on, passing the pond which I had a hunch was the breeding pond for this species. I made another navigational error on familiar paths, which somewhat fatefully provided me with two other sightings; both male and magnificent in their metallic beauty as they hawked along the rides close to the junction of Wellbeck Lane. I was exhausted, but elated. 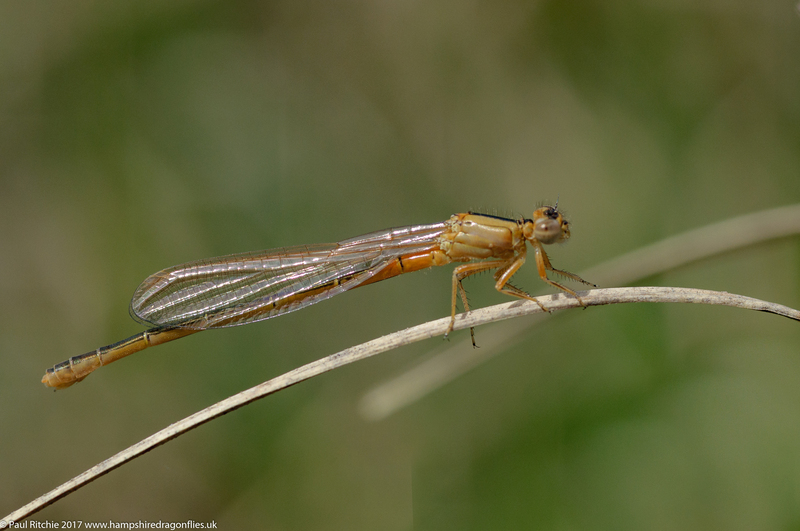 Despite the lack of photos it had been a truly wondrous day, with two new species added to the yearly count and a lifer moment with what I’m beginning to think is my real favourite UK dragonfly. 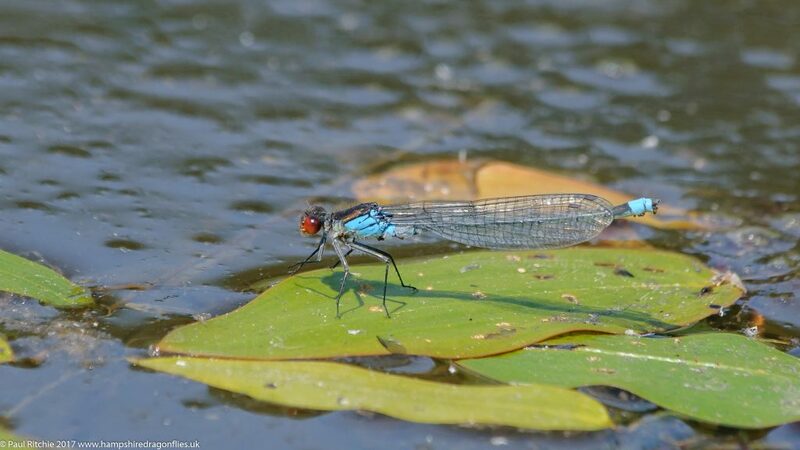 After our tiring experience during Saturday’s heat at Latchmore we needed an afternoon without too much exhaustive foraging, and what better than choosing a single pond. The usual tourist convoy was heading to the fleshpots of Bournemouth for over-priced ice cream and basking, pale & fat urbanites littering the beach. Thankfully we were able to peel off the M27 just before it ground to a halt and headed inland once more to Bentley Wood. 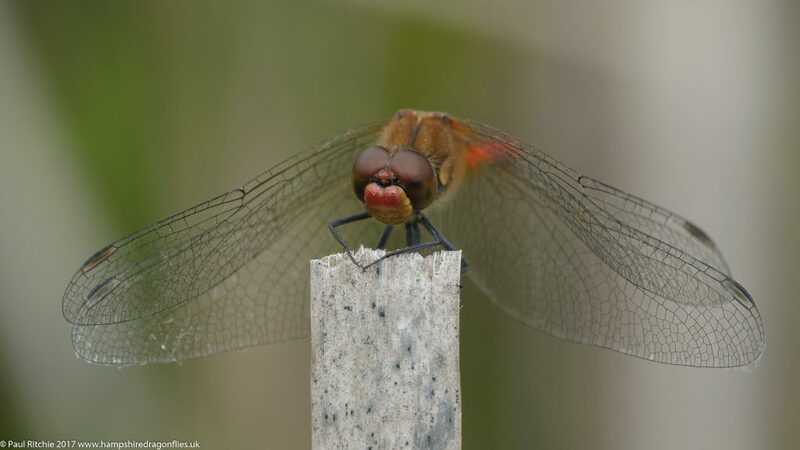 Once at the pond I did the usual scrub search and at the far end found my first Ruddy Darter of the season amusingly choosing to face me rather than pose sensibly for a shot. 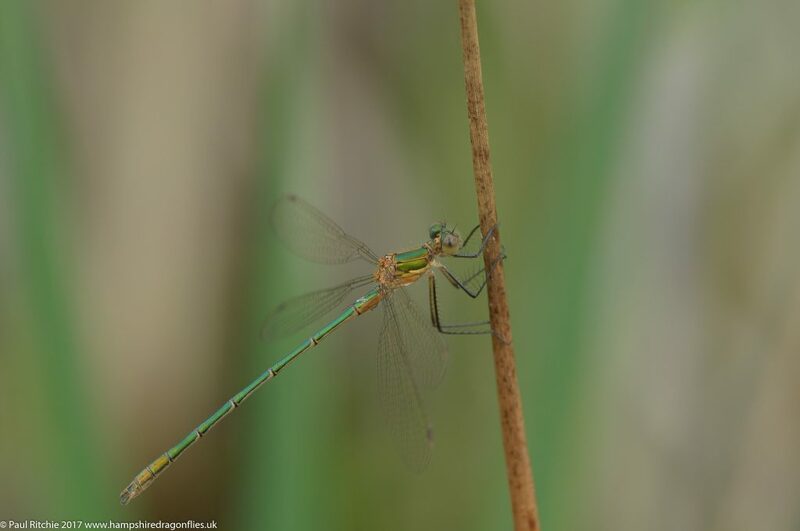 Some of the male Common Emeralds had started to attain the blue pruinescence of maturity and were more active around the margins, joining countless Azure but still not many Blue-tailed. Immature examples still outnumbered the mature. At the opposite end I came across an immature Ruddy Darter, surprisingly satisfied to settle once he’d found a comfortable perch. Certainly the Ruddy here appear to be more accommodating and don’t disappear off at every footfall. Thankfully a Downy was still present over the pond and was holding his own and winning against the Four-spotted bully boys. 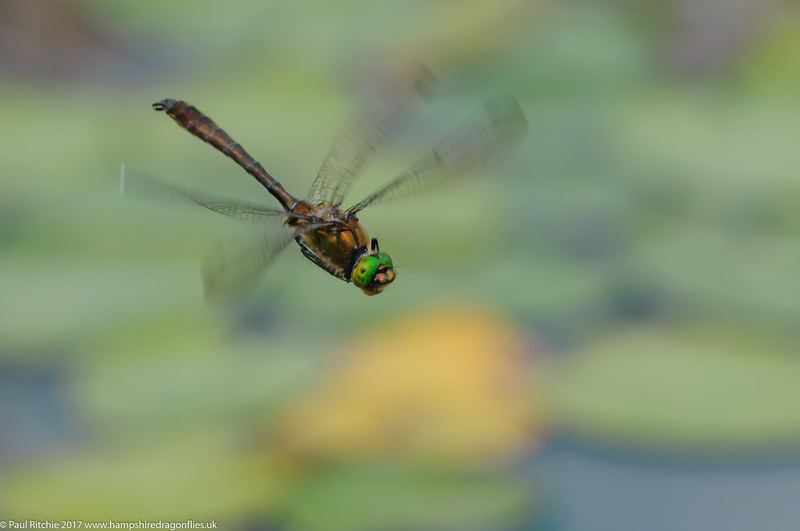 Even the male Emperor retreated at this pocket-rocket’s attitude. I had another scour around the meadows before returning to my spot; a small bay with a limited viewpoint so I couldn’t see my potential subject coming in. It was also difficult to focus on one individual when shore activity caught my gaze. I couldn’t resist this Azure. One way or another I was going to bag that Downy and he finally settled down to run his own territory without shooting off for a scrap. Still a challenge to follow, I waited at my little bay until he appeared to the left, giving me just enough time to grab a shot. Satisfied at last I rose from my little gnome perch and decided to call it a day. The walk back to the car produced our first Marbled White butterfly of the season while the forest rides were alive with Ringlet, Meadow Brown and Silver-washed Fritillary. We even had a passing of a White Admiral but no Purple Emperor on this visit. Still, there’s always next time! It’s been a bit of a fraught month for me with the lack of transport, which is a tragedy as June should be the month of great bounty. However looking back on last season, excepting the trip to Whixhall, the beginning of June didn’t really inspire much either. Funny old month. 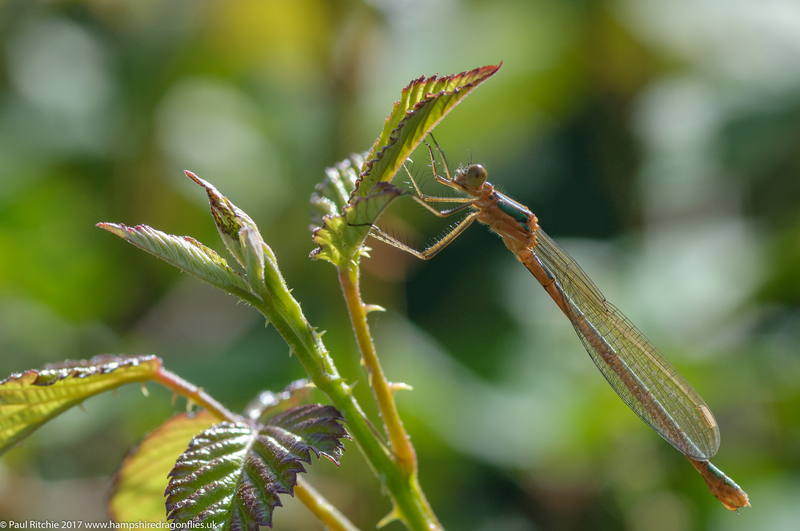 Anyway, at the risk of becoming one of those miserable, always negative dragonfly watchers (there are quite a few) we picked up our feet and made the most of a glorious Saturday by taking a step back; revisiting Latchmore Brook two weeks after the breakdown. Curiously quieter than we expected. Not the usual hordes of weekend picnickers or dog walkers; in fact it was a pleasure to meet someone with a camera who asked what we were there for, and showed great interest without knowing what species they were photographing. 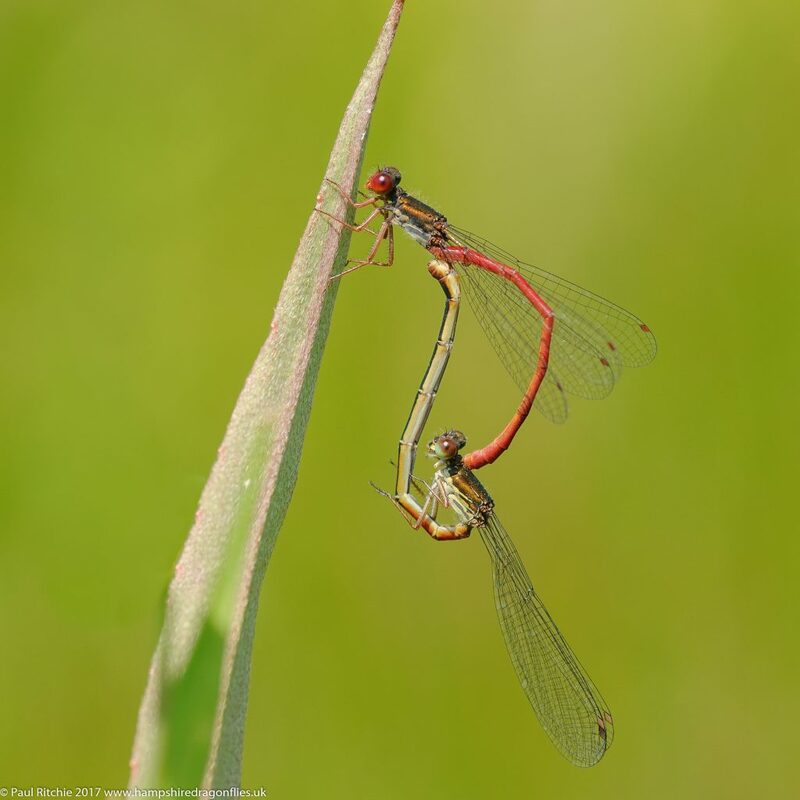 To them it was a dragonfly, but that’s the start of this passion. 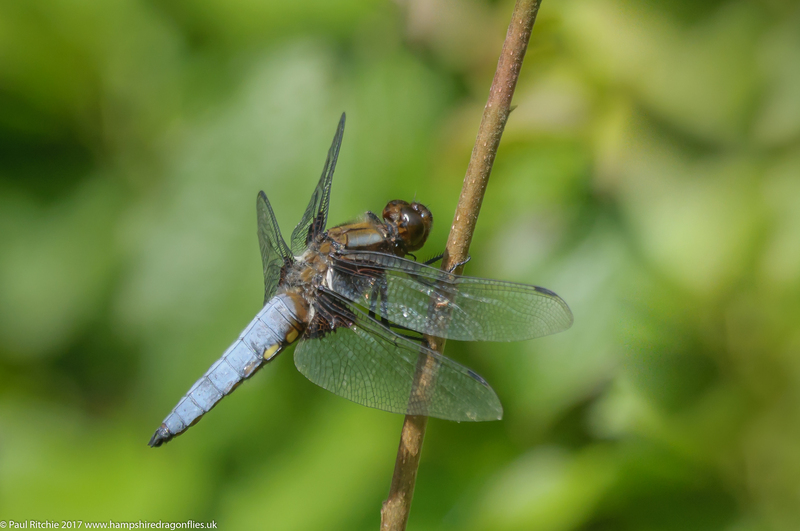 The Keeled Skimmers were the dominant species today; pleasingly putting on a show as only Keeled can do. I saw one male Scarce Blue-tailed on the way in but struggled to find many more today, and I did wonder if they had peaked. It has been an early season for all species which is splendid on the one hand, but you have to worry weather they’ll tire themselves out too soon. 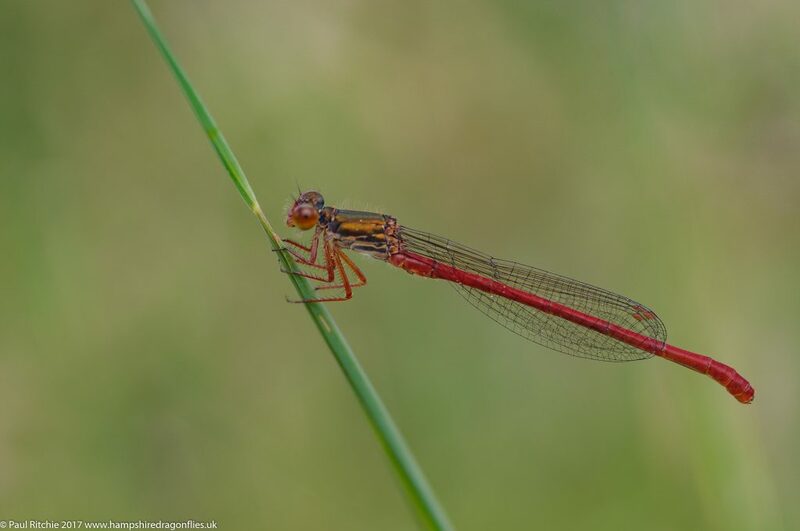 It was a pleasure to see the first Silver-studded Blue butterflies of the season, fresh and scatty and only in small numbers, however for damsels it was Small Red who were dominating the heather. 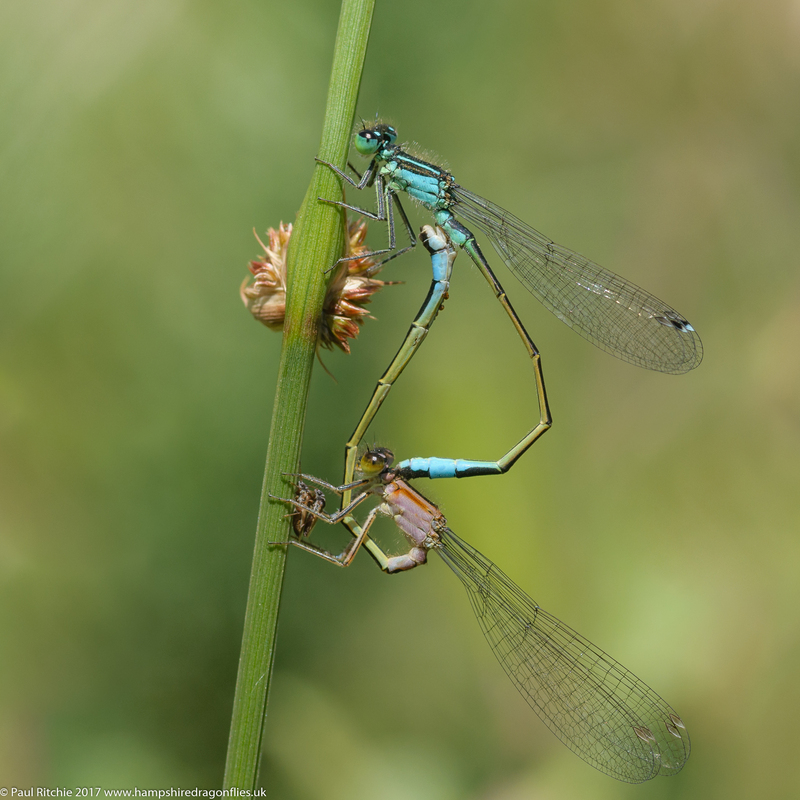 We did find a couple of male Scarce Blue-tailed but they were on a mission and having followed them into the mire I found the deepest hole yet; my left leg disappearing to half way up my thigh! Abandoning the chase immediately Sue called out she’d finally found an aurantiaca female while I struggled to pull myself free, causing my left knee to buckle. This had better be worth it! After finding her best aspect I decided to ditch the scrub search and head up to Gypsy Hollies to see the Southern and followed a route echoing two weeks ago to the stream at the bottom of the hill. By now we were both a tad weary from the heat & hunt and crossed the main flow early to sit & watch two female Emperors ovipositing along the stream, a patrolling male, and the first Golden-ringed we’d seen today; seemingly using most of the stream for his territory. Over to the right a male Keeled had found his female and perched conveniently stream-side for the last opportunity of the day. 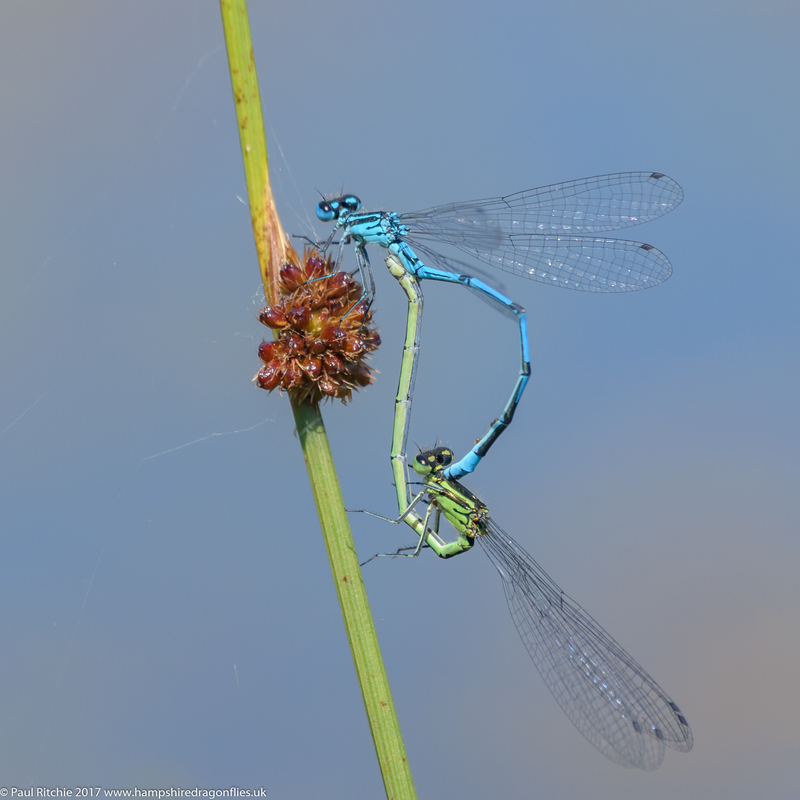 While I was photographing them I thought of how lucky they were to share a moment which is so much longer than the brief encounters experienced by the Chasers. Time well spent! Firstly apologies for the lack of updates recently. On June 1st on the way home from dropping Sue off at work our faithful old jalopy finally passed off its mortal coil. This unfortunate episode occurred on the day I was meant to meet Steve Covey at Latchmore Brook, so you can imagine the effect this had on an even-tempered fellow like yours truly. 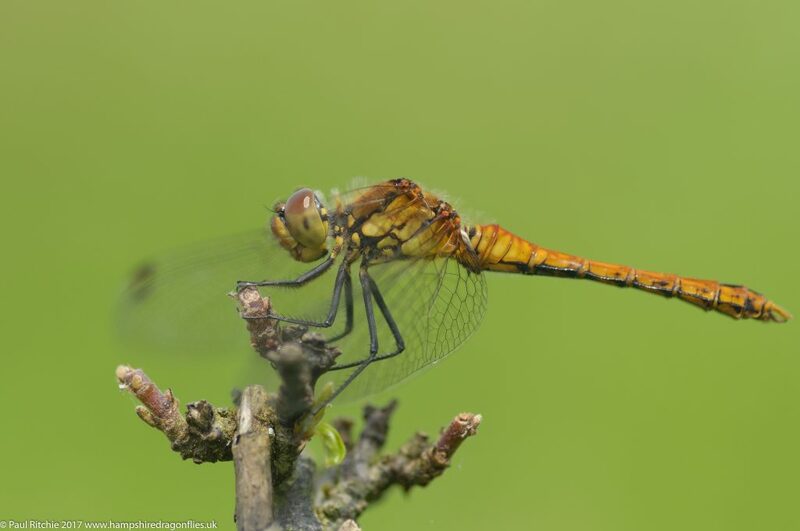 Thankfully the heavens came to the rescue with a week of inclement dragonfly-unfriendly weather. We are still without our own vehicle but Sue has a loan car for work which has enabled us to make a couple of weekend trips to ease the frustration. 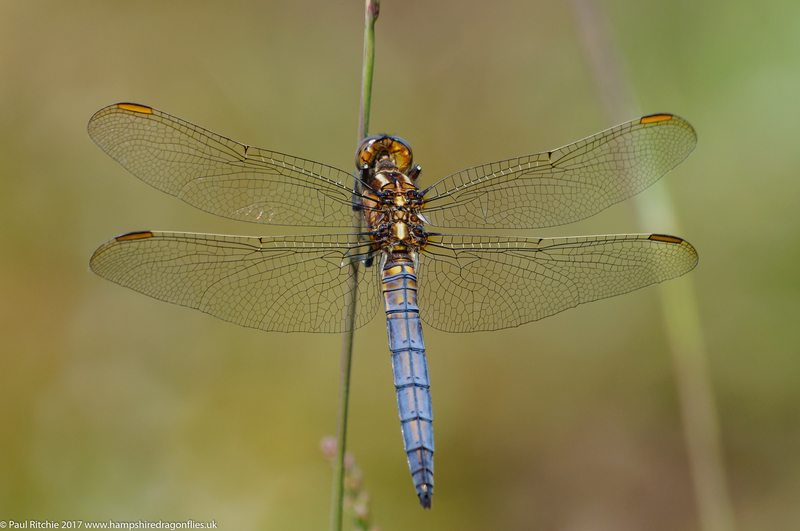 Despite being the season of Springwatch I’ve always followed the meteorological system of naming seasons, and with Emperor and Black-tailed Skimmers dominating at Bramshill it certainly feels like Summer to me. I’m a little disappointed to see the reduction in Spring populations of Hairy and Downy; both which are past their peak. We did see one Hairy today, a female tentatively popping in to drop her eggs under the threatening flight of the Emperor; only to be driven off because, as far as the Emperor as concerned, her time was past. There were also a couple of Downy present on Long Lake, neither willing to follow a predetermined path so I settled for a pair of Blue-tailed in the scrub. We bumped into Aaron and his dog Cody and took a little time out for a chat until we reached damsel corner; all now heading down to roost with the drop in temperature. It’s been far too long since my first and only visit to Bentley Wood this season so Sue & I headed over to meet Tony & Sue Walker who are local guardians to these woods. They introduced us to another pond which we’ve failed to find previously, nicely active with plenty of Azure, Large Red and Broad-bodied Chasers. We carried on down to our pond of choice where we were pleased to find a couple of Downy still patrolling along with a few Emperor, Four-spotted and Broad-bodied Chasers battling against the wind. 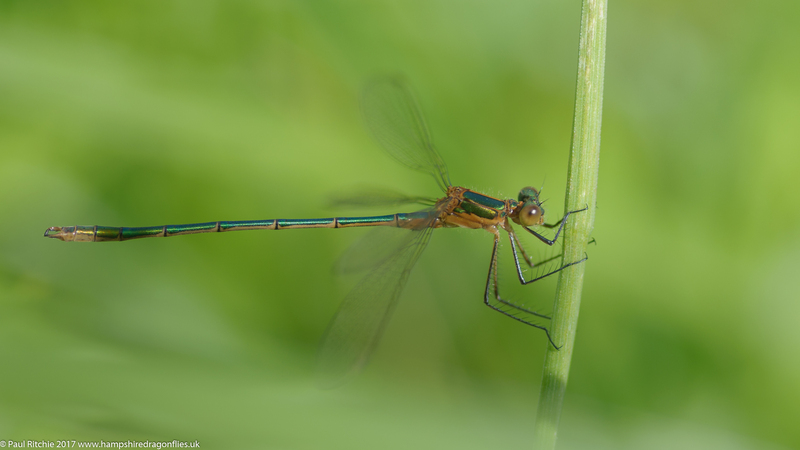 It wasn’t too long before we saw our first Common Emerald of the season. It took me a while to get my eye in; the tenerals proving difficult to pick out during the cloudier moments. 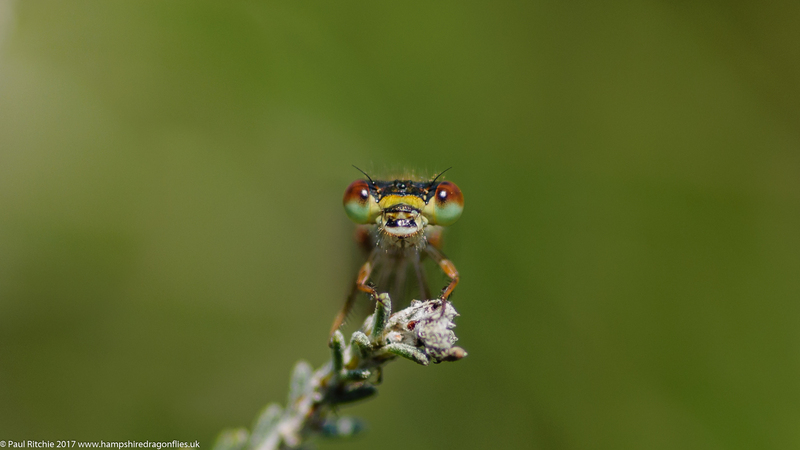 Having found a male I was eager to find a female, and did eventually spot one rising from the grasses to the bramble. Such was her position that the only shot available to me was against the sun. 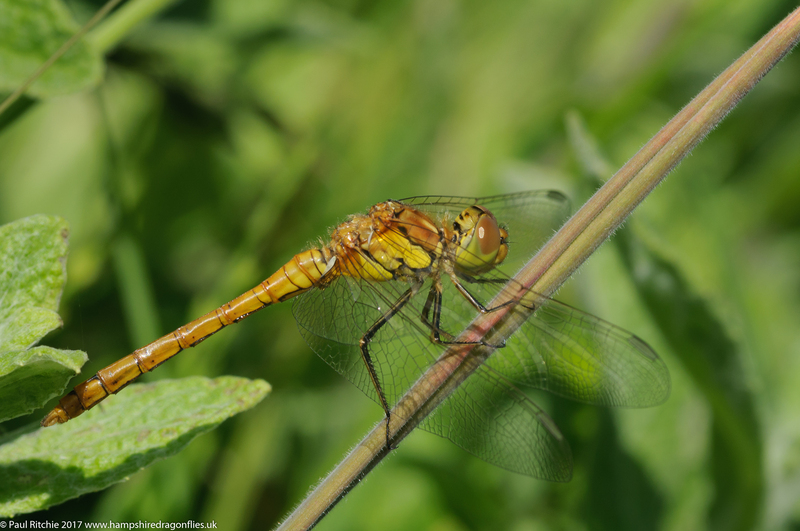 Walking through the meadow I caught sight of a teneral dragonfly and further searching revealed a couple more Common Darters, another one off the list this season. Two new species in a day is more than satisfying however we struck gold on the way out when we spotted a Golden-ringed hawking the ride on our walk back. A good day then, and most appreciated having been stuck indoors for a week. 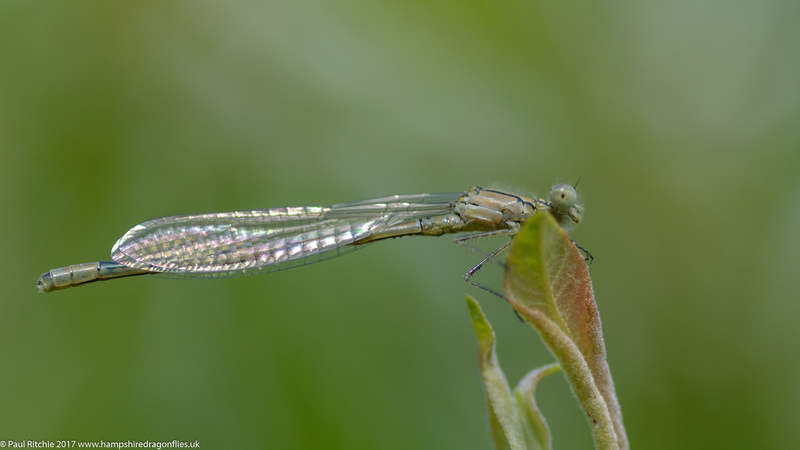 Every season I visit Latchmore Brook to connect with the Scarce Blue-tailed damselflies; usually in mid-June, however as all species except the Large Red have jumped the gun this year I managed to connect with my subject in late May. A prospective foray last week produced just the one immature male a return visit was planned for this Wednesday. 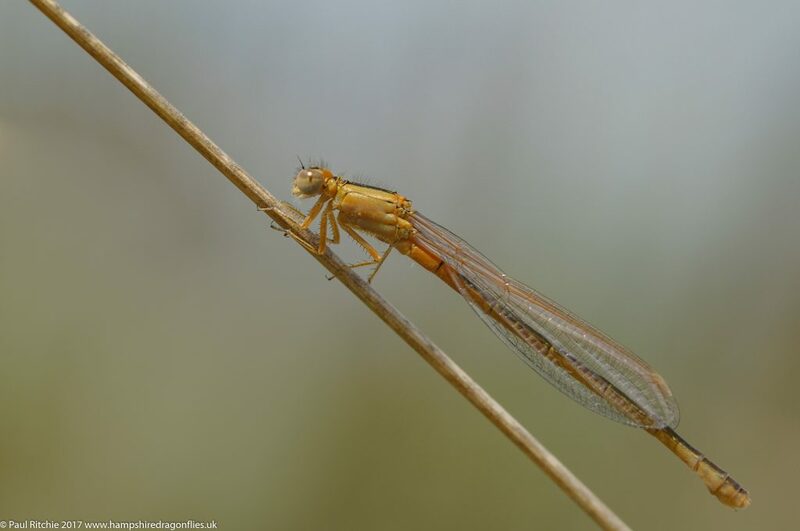 It wasn’t too long before I spotted my first pre-aurantiaca phase female close to the mire, the beautiful and delicate pink hues of the teneral stage just beginning to change to the vibrant orange. Despite a fair amount of light cloud early on I was surprised by the lack of males; I didn’t see one until on my way out mid-afternoon. I did however connect with my first Small Red of the year, satisfyingly bringing my season species total to 20 before May had turned to June. Another pre-aurantiaca caught my eye and offered a better opportunity when she landed low down on a stem. I ditched the monopod and lay on my belly to find the best angle, which happened to be from slightly underneath, perfectly isolated with a background of sky. 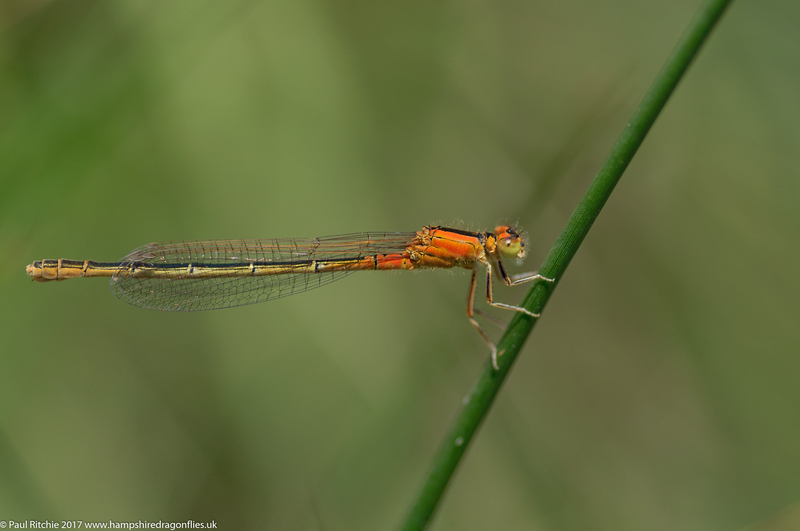 While searching for the more orange version I happened upon a male Small Red. 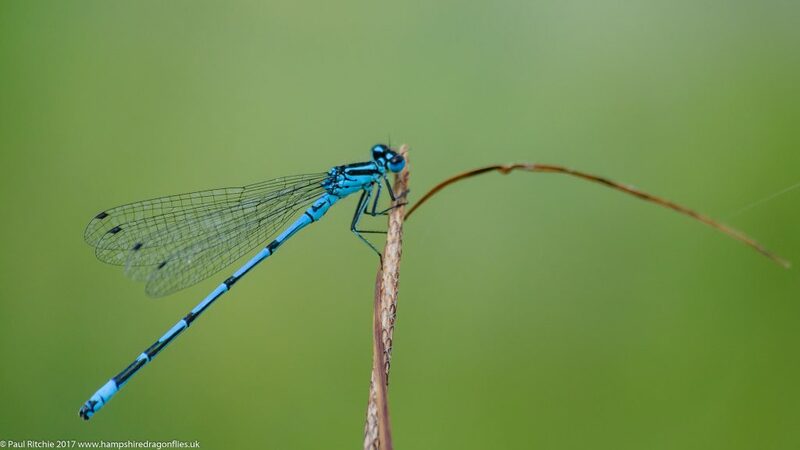 One of the pitfalls of macro photography with such a small subject is the slightest breeze can cause immense frustration, with even the fastest shutter speed unable to cope with even a 7mph average. I waited what seemed like an age for a break in the breeze but it wasn’t to be. In the end I had no other alternative than to spray & pray using manual focus. Auto-focus or indeed the use of a tripod wasn’t going to help here. Still not as sharp as required, but it’ll do until more chances arrive later in the season. I had to wait until lunchtime until I finally managed to secure a true aurantiaca, the vibrant orange impossible to miss against the green of the grass. Thankfully this one was happy to stay in her own chosen sheltered hollow, happily feeding. 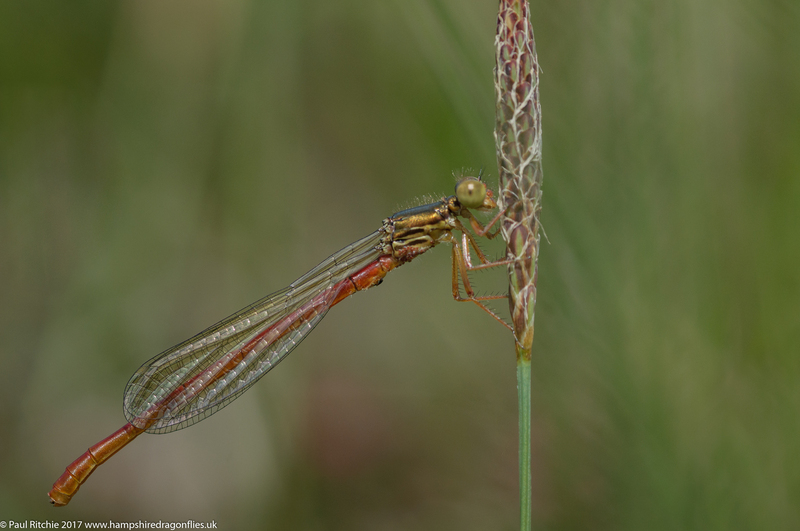 I was content enough just to watch as she rose from her grass stem to take another small fly out of the heather above. After securing my prize I took a walk up to Gypsy Hollies and descended the stream, taking the opposite route to last week. Before the stream turned I noticed an almost fully mature green female busy ovipositing into the shallows. 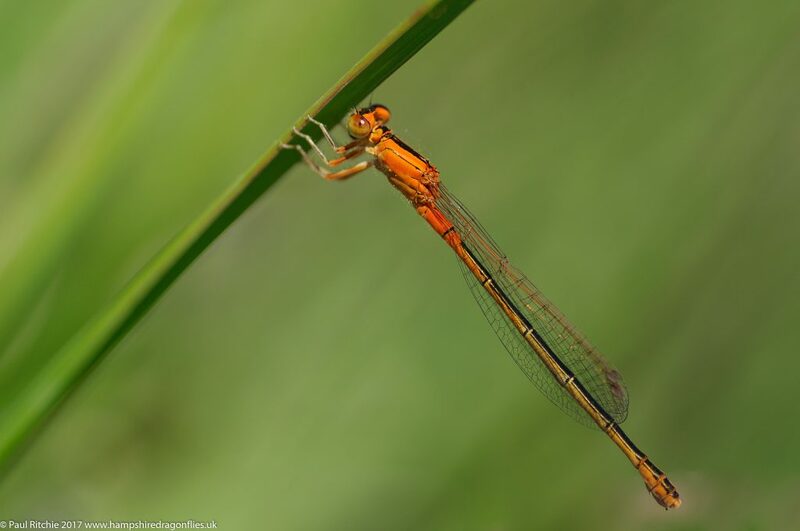 Following the stream as it ran parallel to the main brook I came across quite a few Southern and another aurantiaca along the shoreline, quickly disappearing out of reach. No worries, I was happy just to wander along paths not previously trodden, frequently having to back-track to avoid the boggy areas. I found two more aurantiaca before calling it a day and finally a male patrolling the first flush near the lawn. There’ll be better opportunities on another day.